Elementary Schools across the district exhibit in an art show at the Multi Cultural Art Center (2nd Avenue, Cambridge) every year. This year the exhibit will be in February. Many of the elementary schools have a “Visual Arts Show” in conjunction with other events at the school, and some principals have encouraged the teachers work at having their own art show. The Morse School, for example, has a well attended comprehensive art show at a neighborhood gallery. Students in all CPS upper schools receive at least one class per week for all grades. Each Upper School has unique scheduling challenges, which leaves the frequency of minutes up to the principal’s discretion. 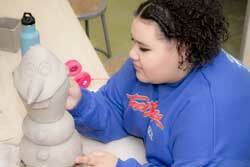 The Visual Arts program at CRLS offers an expansive array of options, including exploratory courses such as Foundations of Art (a required prerequisite for advanced visual art classes) and more specialized classes including, fashion, photography, ceramics, jewelry making, digital art and computer animation.